At last the sun is out and we are excited about all our learning opportunities here in Hawk Class. 'Superheroes' is our topic for the term but we also will be learning about life cycles,(with our resident tadpoles) gearing up for Sports Day and celebrating the Olympics with the rest of the school. PE days will be on Wednesdays and Thursdays this term so make sure your child's PE kit is in school. This term will be full of fun and happy learning! We had a great day today in Hawk Class. In groups of 4, we designed and created various healthy smoothies. As 'Superheroes' is our topic this term - we decided to focus on healthy foods we could put into our smoothies that would give us STRENGTH, SPEED and BRAINPOWER.We then set up a smoothie cafe in our outdoor area in the beautiful sunshine and used real money to buy the delicious smoothies named: 'As strong as Hulk', 'Brain Blast', 'Punch Power' and 'Super Berry Shake'. Luckily for me - I managed to have a taste of all four of the smoothies and they were delicious! We finished by having a fun competition to see who could write down what they thought was in the smoothie they bought from our cafe. (They were obviously not allowed to buy the one they had created) Well done to Molly who won the competition by correctly guessing 5 of the 7 ingredients. Hawk Class performed a musical pirate story 'Treasure Island' to Kestrel Class. We sang and played instruments. Millie and Leo did some amazing acting! 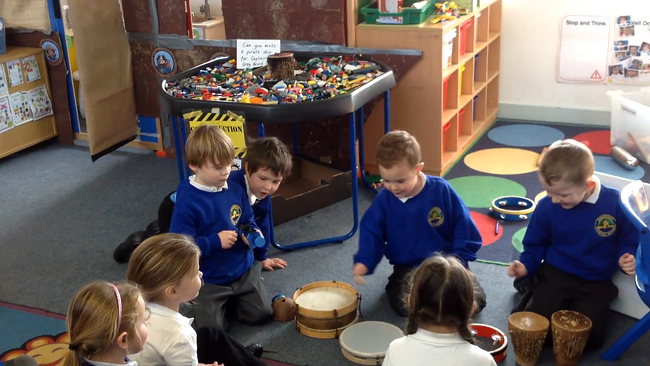 Riley, Callum, Tommy and Leo compose some rhythmic 'pirate' music and then perform it to the class. Millie was going to be baptised at Shrewton Church so Reverend Eleanor invited Hawk Class to learn all about it.